This short trip is an opportunity to visit three UNESCO world heritage sites. You can then see and hear the story behind these magnificent mountains and the railroad as it passes through the untouched and breathtaking nature of the Zagros mountains and feel the beauty that is all around you. After introductions, your tour leader will review the details of your tour. You’ll meet your fellow travelers. 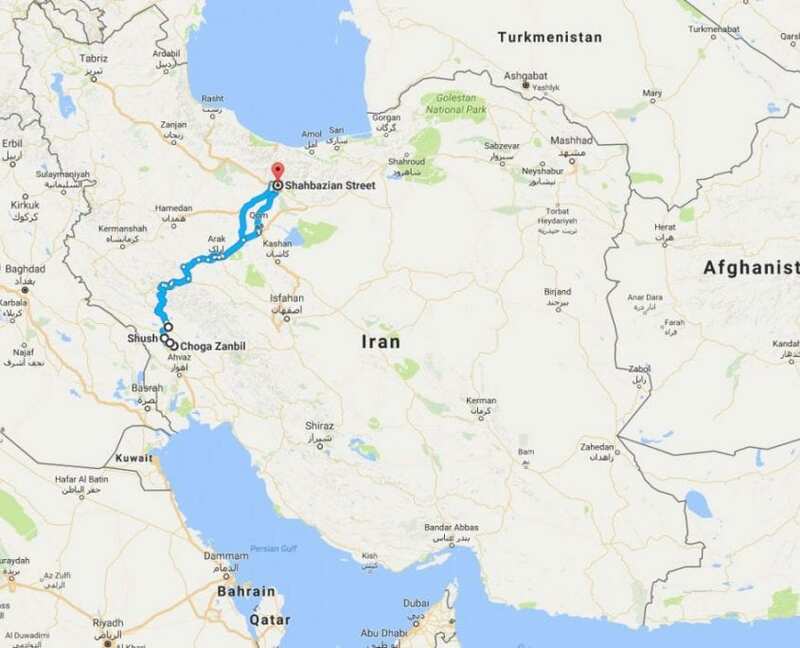 Our trip starts in Tehran in the evening where we will take a sleeper train to Khuzestan. We will get off the train in the morning at Andimeshk Station and will take a VIP bus to begin our road trip. Our first destination is the 6000-year-old city of Shush which is on the World Heritage List. In Shush, we will see Shahr-e-Panzdahom, the Apadana of Darius the Great, and the Castle of the French that was constructed using 3,000 year old bricks. Then, we will go to Haft Tap-e to visit the museum and Elamite artifacts. The third destination is Chogha Zanbil, which is also on the World Heritage List; which is a spectacular ziggurat next to the Dez River. This ziggurat was constructed using millions of bricks which is meant to resemble a holy mountain on the western Iranian plateau in order to be close to and worship Inshushinak, the Elamites supreme god. Finally we will go to Shushtar and will stay at the historical house. In this house we will have lunch and take a rest. In the evening, we will visit the historical hydraulic system in Shushtar, which is on the World Heritage List and will learn about the 1500 year old water engineering system that is here. In the morning after having breakfast, we will visit Shadravan Bridge and then begin our rail car (Derezine) trip at Andimeshk Station. A rail car is a small rail vehicle that can carry up to 10 passengers at one time. It allows for a panoramic view while it is moving and will provide passengers with a completely different experience to what they have had before. Our first visit is to Dokooheh Station which was one of the most important garrisons during the Iran/Iraq war. Slowly we will move from Plains of Khuzestan towards the Zagros Mountains in the east. After passing Gol Mahak Station, we will reach Balarood where we will visit some buildings and structures which tells the story of the early years of constructing the railway. On our way to the Zagros Mountains, we will visit two significant bridges named Dam Dam and Shahbazan, both of which are unique technically and aesthetically. This is a unique opportunity for those who are interested in taking nature pictures. After this, slowly the wonderful and great rocky walls of Zagros will reveal themselves as we prepare to go through several and sometimes long tunnels. Multiple tunnels is one of the unique features of the railway in this area. Tunnels will emerge one after another and will provide a thrilling rush as we travel through the dark. Passing through these tunnels by rail car is an opportunity to experience a different way of traveling on railways. Afterwards we will visit a bridge that had historical significance during the Iran/Iraq war. Along the way, the Dez River will accompany as we continue to see the beautiful sight of the mountains. Before entering Tang Haft Station, we will visit some other railway bridges and also some tracks that were used at the beginning of the construction of the railway system. We will say goodbye to the rail car at Keshvar Station and after taking a rest for a while, we will get ready for our trip back to Tehran. We will arrive at Tehran Railway Station. Travel with the private train (the only 5 star train in Iran).